Ever since I saw the recipe for shole maash online in the 19th century Qajar Women Cookbook, I have been thinking about giving it a try. 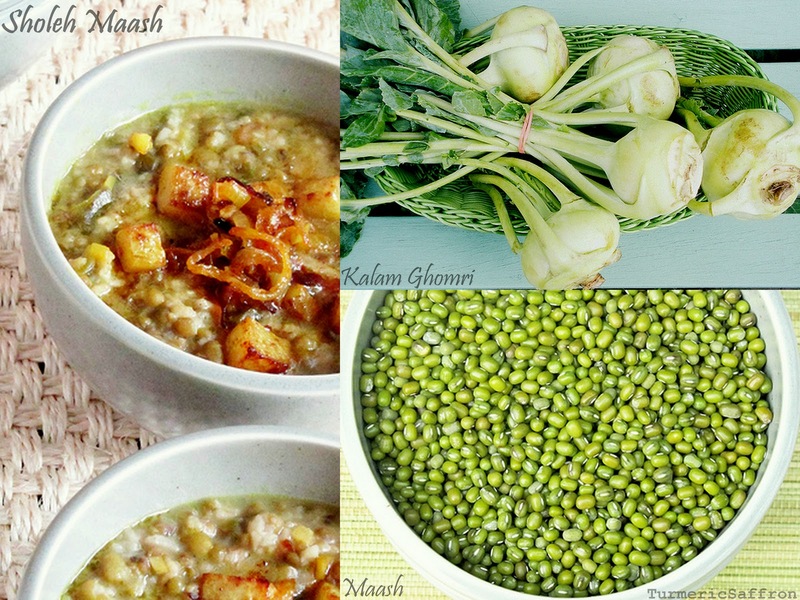 شله ماش Sholeh Maash (mung beans with kohlrabi) makes a tasty and nutritious autumn soup. This recipe, like the others in the book, consists of a brief description of what the necessary ingredients are, and the word yek-meghdar (some) is frequently used to describe the amount needed for each ingredient. Persian cuisine is forgiving in terms of measurements and when you ask a grandmother for a recipe the answer is basically a list of the ingredients with yek-kami (a little bit) of this and yek-meghdar (some) of that and that's how I, along with many other Iranians, learned to cook. I learned that you can use a little less or a little more of most ingredients in a recipe depending on your taste and preferences. A few months into blogging I bought a food scale to measure the ingredients by weight but I have rarely used it. 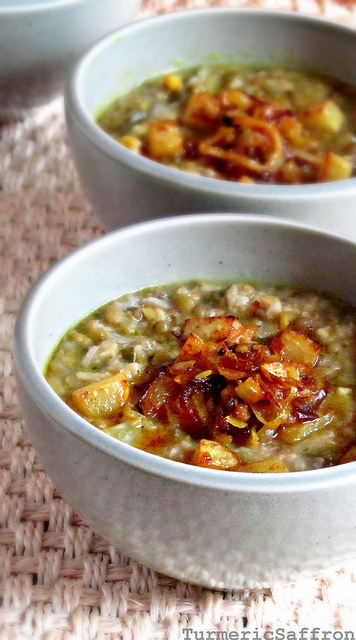 Sholeh maash is not a thin and watery soup. It's a rather rich soup that can be served as a main dish. The original recipe calls for meat but I've decided that it is substantial enough without the addition of any lamb or beef. Place the beans and the rice in a large pot, add 6 cups of water and bring to a boil on medium-high heat. Add the small pieces of kohlrabi, salt, pepper, cover and cook for 45 minutes on low heat. Periodically check to see if you need to add more water to the soup. Add the chopped vegetables, taste and adjust the seasoning, add more hot water if needed and let it simmer for another 15 minutes for the flavors to blend in. In the meantime, fry the sliced onions in 3-4 tablespoons of hot vegetable oil in a skillet until golden brown. Add the turmeric powder and the minced garlic to the oil, stir and saute further for another five minutes. Add a large tablespoon of the fried onion to the soup and gently mix well. 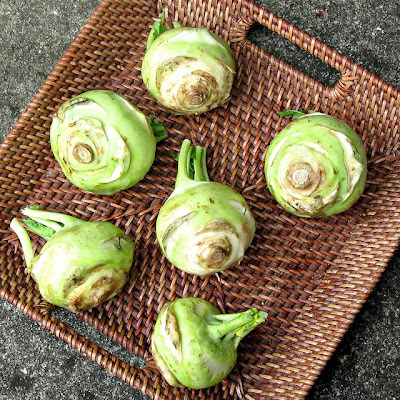 Lightly fry the cubed kohlrabi in 2-3 tablespoons of hot vegetable oil until soft and golden on medium heat. Add a pinch of salt, turmeric, cumin and red pepper and stir well. To serve ladle the soup into a soup bowl, top with the fried onions and kohlrabi. Serve hot with bread and yogurt. We are in the last days of summer and even though I am savoring each and every day that's left I am very grateful and excited for the beginning of fall season and yet another school year. The days of holding my daughters little hands and joyfully walking them to the line outside of their classrooms have been long gone. I vividly remember my eldest daughter's first day of first grade when she walked into the classroom cheerful and I walked away with tears rolling down my face realizing at that moment that this was the beginning of a long journey in life for her and that I wouldn't be able to hold her hands forever. I have always wanted them to be independent, to stand on their own two feet and roam the world freely but sometimes letting go is not that easy. I remember my first day of first grade very well, but it's the night before the first day of school that stands out in my mind. In Iran, the first day of school starts on rooz-e aval-e mehr (the first day of the month of Mehr) according to the Persian solar calendar which is also the first day of fall (September 23rd, the autumnal equinox). It was the night before the start of school, with my three older siblings in high school, a sibling in elementary school and a new born baby brother, the house was in such a chaos that as I was getting ready for bed I realized that I had no book bag, no lunch box and no school uniform to go to school with the next day. That night I went to bed with the jitters, worrying about not having everything ready. However, when I woke up in the morning I was amazed to see a brand new lunchbox, a beautiful new book bag and a hand-sewn uniform by my mother next to my pillow. I never asked my parents about how they were able to acquire those things so late at night but I guess I didn't want to ruin the special moment in my mind. 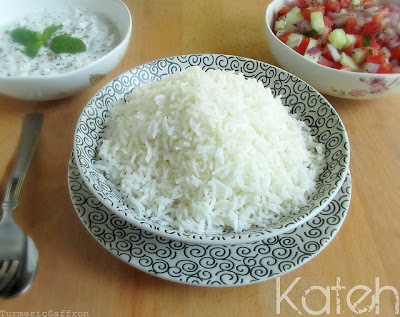 کته Kateh is the easiest and quickest way of preparing rice. In fact, this was the first recipe I learned to cook as a child. 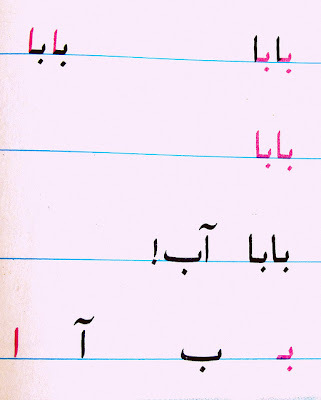 My mother taught all of us to make kateh as a child. The simple no-fuss recipe involves adding about two parts of water to one part cleaned and rinsed rice in a pot, adding salt and oil and letting it simmer on low heat. 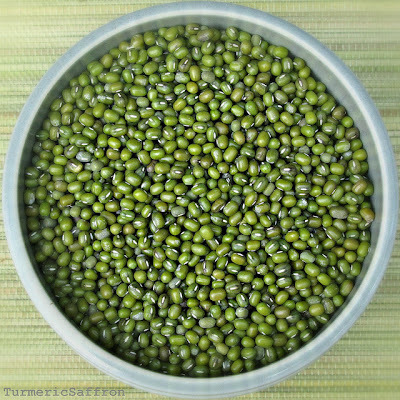 I have posted many rice/polow recipes and almost all of them except one (dami baghali) are made by bringing lots of water to a boil, adding rice, draining the water and steaming the parboiled rice with or without other ingredients. In making kateh we use the absorption method where the water is not thrown out and the rice cooks until the water is fully absorbed. The rice in kateh may not be as fluffy as the rice in polow but it's definitely tastier. Also, kateh does not have a crispy and crunchy tah-dig. 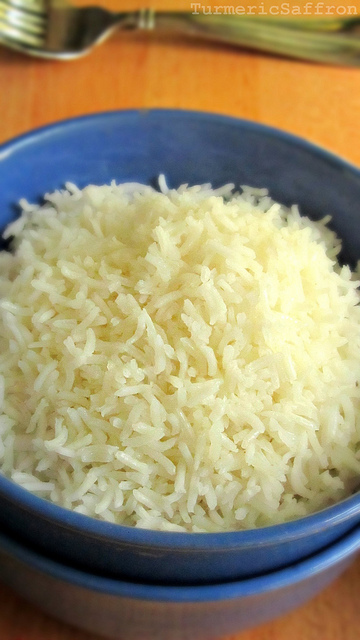 Depending on the type of rice, you may need to adjust the water and rice ratio. 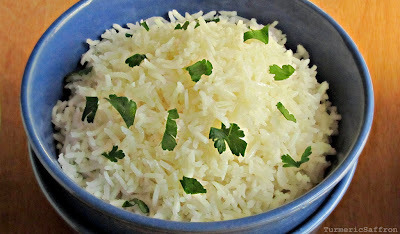 I prefer using basmati rice for it's flavor and aroma and because it's somewhat similar to the very flavorful and aromatic rice from the northern region of Iran. 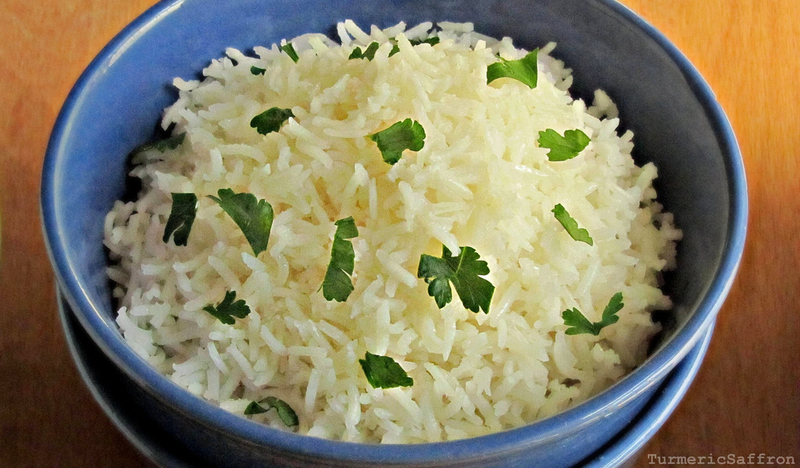 For a less sticky and more fluffy and firm rice use 2/3 cups of water for a cup of rice. There's also the old Persian method of measuring the needed amount of water for rice by covering the rice with enough water in the pot to reach up to the first joint of your index finger. An easy option instead of making kateh on your stove is to use a rice cooker that also makes tah-dig! Personally, I wouldn't recommend it simply because there's a joy in preparing a meal the old-fashioned way by taking the time, care and effort to cook whenever possible. Rinse the rice 2-3 times with cool water or until it becomes clear, discard the water. 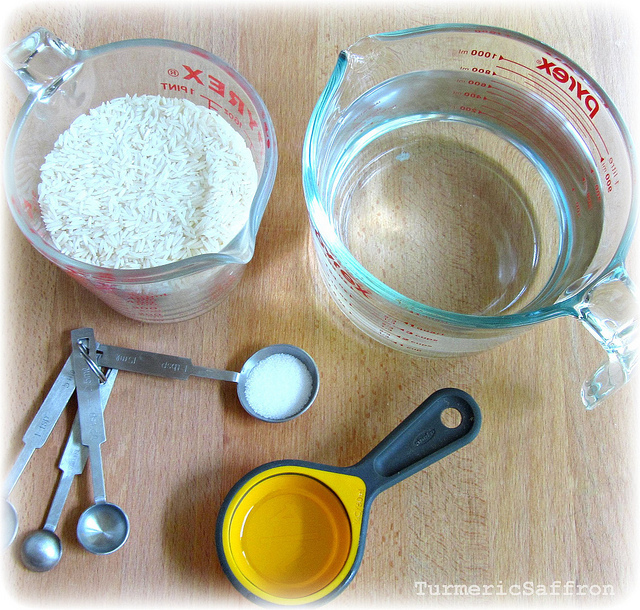 Place the rice in a medium-sized pot, add 4 cups of water and 1/2 teaspoon salt. Bring to a boil on medium-high heat. When the water starts boiling add 2 tablespoons oil or butter depending on your preference, gently stir once or twice with a wooden spoon. 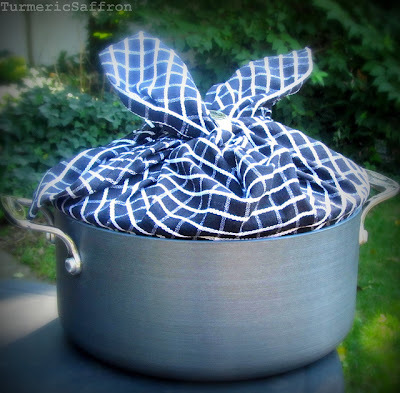 Wrap the lid with a clean dishcloth, cover the pot and cook on low heat for about 30-40 minutes. Serve the rice on a platter with yogurt, salad or your favorite khoresh.